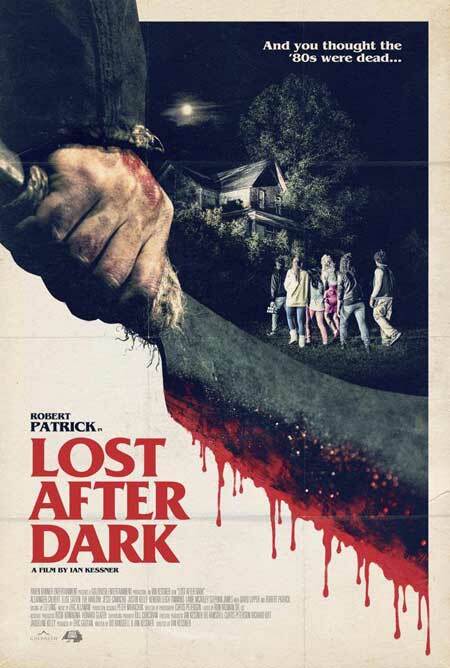 Ostensibly made in 1984 and shelved until now, LOST AFTER DARK is in fact a new film that goes to great pains in capturing the look and feel of eighties teen slasher movies like PROM NIGHT, THE BURNING, and MY BLOODY VALENTINE. I don’t mention HALLOWEEN, or even FRIDAY THE 13TH, because it’s obvious that director/co-writer Ian Kessner is intentionally emulating the less classy but nonetheless fun films of this ilk. If you’re the sort of person who can’t understand why Kessner wouldn’t take his cues from “better” films of the genre, then you’re probably not the right audience for LOST AFTER DARK. The plot is pretty standard issue for this sort of movie: a small group of high school students ditch the big dance and head out for a little beer drinking and hanky-panky at a hunting cabin owned by the father of one of the kids. Unfortunately the school bus they’ve borrowed runs out of gas. But hey, maybe the night can still be salvaged – there’s an abandoned old house just off the road that should be a perfectly fine place to party. What could go wrong? As expected, the spooky old house, which of course isn’t as abandoned as our fun seeking cast thought. It’s occupied by Junior Joad (Mark Wiebe), sole survivor of a cannibal clan believed to have been wiped out in a police raid years ago, and he doesn’t take kindly to trespassers. As their numbers dwindle, it looks like the only hope the kids have is if their Viet Nam vet assistant principal Mr. C. (Robert Patrick) shows up to save the day. Things progress more or less the way you’d expect, but with enough little surprises to keep fans on their toes. About the only major criticism I have is with the unnecessary attempts to make LOST IN THE DARK look like parts of the film were damaged, including a “missing reel” gag ala GRINDHOUSE. That made sense in the Tarantino/Rodriguez double feature because that’s how a lot of those sixties/seventies exploitation movies looked even on their original theatrical runs. But here we’re paying homage to a kind of movie that was more mainstream and of more recent vintage. Simply getting the color palette, acting and directing styles, and the look of the special effects to look appropriate for the era is more than enough. For the most part, LOST does that almost perfectly, the one misstep being a severed head gag near the end of the film that should have been done with a rubber head instead of superimposing the actor’s actual face into the scene. A small quibble, but one that matters in films like this. On the whole, though, LOST AFTER DARK isn’t much better or worse than the films it emulates, which should be just fine for anyone who would intentionally seek out a retro slasher movie. For starters, it isn't trying to be campy or tongue in cheek. The cast is likeable (except for the snooty couple we’re supposed to dislike), and the movie takes its time letting us get to know them before it starts killing them off. While LOST AFTER DARK doesn’t shy away from violence, it doesn’t wallow in it, either. Given that this is supposed to be a 1984 film, that seems about right as the backlash to the first two FRIDAY THE 13TH films had resulted in a tightening up of the ‘R’ rating with regards to violence at that point in time. Now you can see gorier scenes on prime time TV. Regardless of how much blood flows, though, the film is well made and entertaining, and should please all but the most nit picky of slasher flick fans. 3 out of 4 stars.